Anke recently visited three cities in China as part of NEF Consulting’s work on a pilot project for Raleigh International to examine the longer term social and economic impact of in-county youth volunteering. Assessing the socio-economic impacts of projects and interventions for public, corporate or charitable organisations is a core part of our work at NEF Consulting. However, spending 10 days across three cities in China to hear first-hand accounts of Raleigh Expedition alumni 18 years after they participated is not our usual day-to-day work. I have just returned from China, where I explored the question ‘What are the socio-economic long-term impacts of in-country volunteering?’ with Raleigh International alumni from 1998. On the way to Beijing, I wondered how much I remember from something I did almost 20 years ago and to what extent these experiences shaped who I am today, or still play a role today. I felt this would help me manage expectations about the answers I might get during the interviews I was about to conduct. It turned out that almost all the interviewees remembered the Expedition in detail. In addition, they provided a wealth of information on how they felt back then, the changes they experienced at the time, and the role the experience has since played in their personal and professional lives. When asked about their favourite memory of the Expedition, the majority of those interviewed answered ‘trekking’. Unlike participants from other countries, hiking and camping was a new experience for the Chinese venturers. Then and now, 18 years later, they feel the Expedition had inspired their passion for nature and the outdoors, as well as a trust in their ability to overcome challenging situations. We’re only now starting to analyse the interviews from China, and this is only a small part of what I learned from them, so it’s far too early to suggest any conclusions. Saying that, I interviewed a couple who had met during the Expedition in 1998 and who introduced me to their two children – a ‘Raleigh China family’. So there is, at least, a sense of positive long-term impact in China. My colleague Emily is now meeting Namibian alumni, as part of the wider project for Raleigh International, so stay tuned for updates. As a leading international sustainable development charity that enables young people from around the world to create lasting change though volunteering, it has developed a global community of Raleigh alumni. Over 30 years, Raleigh International has consistently helped young people develop personally and more widely – engaging in advocacy, leadership and governance in their communities. This project will look at how Raleigh’s vision of a global community works in practice, raise awareness with in-country young people and provide substance to Raleigh’s goal of delivering lasting change through youth. The aim of the pilot project is to begin to develop a body of evidence of the positive long-term social impact of Raleigh International’s work with in-country youth. It is hoped that this work will become the foundation for a major research project. 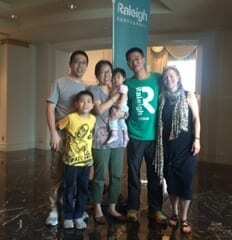 You can read blogs written by Raleigh International Alumni here.